Bringing together emerging and established artists from Russia and Ukraine, the 'Borderlands' exhibition at GRAD in London explores the fluid boundaries between art, activism, and action – whether in Kyiv or Moscow. Ukraine is probably the least peripheral borderland in today’s world. The borderland cliché – worthy or not – commonly arises when discussing the country’s multi-ethnic composition, strategic importance, or historic provenance. The borderland explored at London’s GRAD (Gallery of Russian Art and Design) is a more fruitful fault line – the one between art and politics. Bringing together emerging and established artists from Russia and Ukraine, the 'Borderlands' exhibition explores the fluid boundaries between art, activism, and action – whether in Kyiv or Moscow. 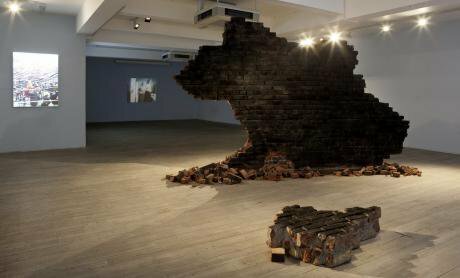 The focus of 'Borderlands' is a work called Untitled, a striking brick-wall silhouette map of Ukraine, blackened by fire on one side and plastered with fading Soviet-era wallpaper on the other. A 2014 work by Kyiv-based Zhanna Kadyrova, the precarious nature of the construct reflects its times. Kadyrova had originally intended to use a piece of masonry from the very epicentre of 2014 – Kyiv’s Maidan. Weakened in the fighting, the walls proved too fragile for the purpose, and material from an abandoned Soviet factory in Shargorod, western Ukraine, was used instead. A point made with a sledgehammer in every sense, Kadyrova’s work is a looming testament to the need for Ukraine’s national unity and territorial integrity; and the political conviction of such unity becomes an aesthetic statement. Here, Ukraine is charred beyond recognition, disfigured through the loss of the Crimean peninsula, which lies broken off in its shadow, metres away across the floor. Created in 2014, as Russia commenced its military intervention in Ukraine, Kadyrova’s piece reflects the tensions of the time. Behind Kadyrova’s silhouette, facing its Soviet adornment, hang costume designs for protesters by the Krasnodar-based ZIP collective. Founded by four young artists in 2009, ZIP gained inspiration from the cavernous spaces of the abandoned measuring instruments factory in Soviet-era Krasnodar (whose acronym 'Zavod izmeritelnikh priborov' they bear). Resembling the experimental designs of the early Soviet avant-garde and agit-prop, the curiously dressed cardboard cut-outs of Spring Fashion (2015) seem like actors in a Malevich or Rodchenko pantomime. Most engaging is the group’s Brain-Twister Workbook, which offers unsolveable and sinister puzzles – with lurid, childish illustrations. ‘What rank of KGB officer reads your emails and tweets?’ asks one page. Another invites us to sketch our fear. We are also urged to identify the permitted manner of protest under Russian law. These are chillingly practical absurdities. The activities of the ZIP collective in their home region of Krasnodar have taken a creative approach to resistance, claiming a public presence for contemporary art. Their guerrilla-style actions play with, and mimic notions of authority and coercion. An unauthorised pedestrian crossing was painted on a road outside the Black Sea resort town of Anapa, only to be officially reproduced on the very same spot by the Traffic Safety Administration. Without Dictatorship of the Gaze (2013), takes us beyond this charred brick borderland. This series of photographs by Nikita Shokhov, draws on his interest in political demonstrations in Russia and the country’s youth, with the Urals-born photographer combining multiple perspectives of a single scene, displaying them in an illuminated box. Nikita Shokhov's Without Dictatorship of the Gaze. Image via GRAD. 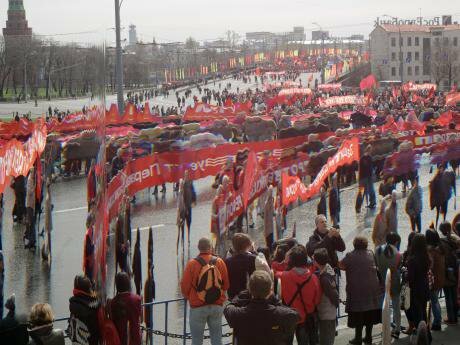 The warped panorama scenes of demonstrators in Moscow – ‘the epicentre of national absurdity’ – invite us to consider the manipulation of their subject matter. Photomontage has a long tradition in Russian art – from Eisenstein to Vertov – and this man with a movie camera can be no less unnerving. These protesters may be stretched and warped to oblivion, but only through a plurality of perspectives. It’s either a liberation from form, or a cynical political choreography – Vladislav Surkov hides in these distorted masses. Courbet’s Funeral (2014), a cryptic ‘video-diary pretending to be a document’, is the contribution of Moscow-born Evgeny Granilshchikov. It is a short video collage film, comprised of clips filmed on mobile phones, and short interviews with young Russians trying to make sense of their personal histories in the wake of the country’s contemporary political dynamics. ‘As long as there is mass media,’ reflects one young woman, ‘it seems to me that it’s impossible to feel calm, to feel more or less yourself, wherever you are’. Hastily filmed, upside-down shots of OMON riot police on Red Square flow into photos of the Prague Spring, 1968, and personal recollections of the Bolotnaya protests. As a chest rises and lowers with each breath in a close-up shot of a camouflage uniform, an anonymous text message rings out: ‘A curtain on my window and my head on fire’. Another young woman strokes a cat and holds a cigarette. ‘The director is disappointed with all the social roles a person can take’, she claims. These vignettes were filmed between July and November 2014, and include both real-life and staged scenes. There is an interesting parallel with Shokhov’s work in the distortion and pixelation of this mobile phone footage, which lends it a certain intimacy, privacy, and with it, the possible suggestion of political agency. Granilshchikov has described his films as a manifesto, and while the exhibits at 'Borderlands' may be poignant, they are not picturesque. Artist and activist sometimes make awkward companions, but the urgency of this message, here makes one wonder whether they must needs be. ‘Whether you’re a curator or an artist,’ she continues, ‘you make your own history all the same’. Borderlands (curator: Sergey Khachaturov) runs at GRAD Gallery from 20 March to 16 May 2015. Standfirst image / Image 1: Zhanna Kadyrova's untitled installation, picture courtesy of Sophia Schorr-Konn / GRAD.